North Wales Bouldering News ::: News Details :: Kakapo 7A+! In an effort to escape the heat, Owen Hayward has made a few evening trips to the usually damp woods near Waunfawr finding Fontainefawr and Parc Dudley as dry as they get. Owen climbed the existing highball lines on the Consultant (p. 446: NWB guide) and Grande Bleu (p.449) walls before adding 2 more highball beauties. First up was the left arete of the wall which The Freelancer climbs. The Numbty 6C! * starts sitting using the arete and a shallow mono and climbs the right side of the lower arete and crack to gain the upper arete and a fine, bold finish up the right side of this. Avoid using anything left of the arete and crack for the full tick. Next was the left arete of the Grand Bleu wall (project line 13: NWB guide). Kakapo 7A+! ** starts sitting undercutting the Kakapo's beak. 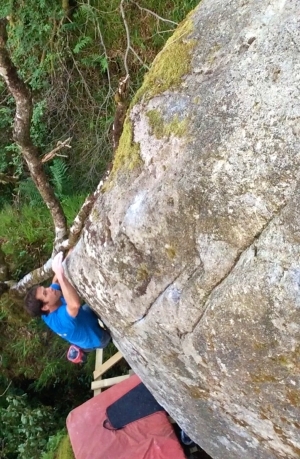 A hard start leads to a big hidden hold at around half height on the arete. From here step out right into the cracked shallow groove and climb this using glorious rough pinches. Owen tamed the gnarly landing with a makeshift wooden platform but it's still pretty spicy so at least 3 pads and a spotter are recommended. Owen also climbed the sit start to Balle Haute on the same wall - bumping the grade to 6C. Click the link at the bottom of this news item for a video of the problems. Early morning or late evening visits are best for cool conditions but make sure to take the full midge armoury!